I've just been catching up with my reading, with this months Smart Sigger magazine. This months issue includes Ebor Handicap Trends, a piece on the wisdom of crowds that looks at why starting prices reflect the true chance of a horse, a continuation of their implementation of a Bayes Theorem method. A system for betting debutantes in handicaps and an interesting piece about why you shouldnt always use past results as an indication of future performance. But the piece I want to talk about today is a discussion of whether you are a gambler or an investor, which provided a reminder of the formula that you can use to calculate your longest expected losing run. I think we have published this formula before but it's always worthwhile to revisit important fundamentals. The gist of the article was that if you dont stake your bets consistently with your longest expected losing run then you are a gambler not an investor. If, like me you no longer have your log tables to hand, then you will need to use Excel or something similar to make the calculation. By way of an example lets assume that we expect to make 400 bets this season and that the methods we use have a strike rate of 20%. The 20% has to be converted to a decimal number, so we divide by 100 to give 0.20. So with a 20% strike rate over 400 bets we can expect a losing run of between 26 and 27. Eddie Lloyd who wrote the piece goes on to state that if you intend to be an investor and not a gambler you had better have a bank and a stake size that can cope with the losing runs you can expect. I'm a bit behind with my reading at the moment, but I've just started reading the March edition of SmartSigger. The first thing that has caught my eye this month is an article about not following Racing Post selections and how you will lose money of you do! The Racing Post’s has, on average, 46,871 people buying the paper everyday and averages 1.2 million unique users to their website every month. This equates to around 42,857 people per day. Around 30% will be cross over according to the their advertising information. This means that nearly 76,000 unique people are reading the paper and, according to further figures, 31% of them bet everyday. 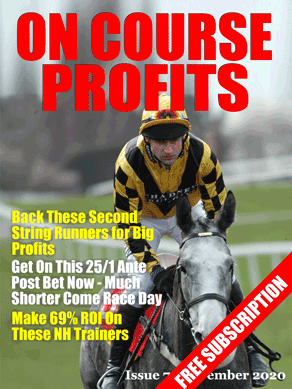 we will assume that those that bet everyday can afford at least a £10 bet per horse. That is £235,600 being bet into a market, more often than not on the same horse. The thing is about the Racing Post selections is that the bookies know what they are before you do. They also know that these will be the horses that take the most money and so they can shorten their prices on these horses, to make sure that they are not giving value on the most popular horses. But what this does mean is that if you go against the Racing Post you are almost certainly getting better value in your bets. This is why services like Value Backing and Value Seeker are profitable, because they will not bet on the Racing Post selections, because there is no value. From a sample of 330 bets taken from last year, his (Pricewise) strike rate was 12.4% and to advised prices was 11 points in profit. However, to SP he showed a 50 point loss. That’s a hell of a difference and serves to illustrate how once in the media’s grasp we should be avoiding these horses like the plague. You can read the full SmartSigger article in this months issue here. I was at a bit of a loss as to what to write about today. So I've decided to share some data from research that I'm doing to find new betting opportunities for myself. As we've probably mentioned here before, it is widely considered that Betfair Starting Prices reflect the true price of the majority of horses. Which means there is no value to be had if you are betting at the off. My view is that if you know something that the crowd doesn't then there is always value, but nevertheless it is easier to profit by having your own view and using early prices than it is from following the markets. So with that in mind I'm looking for ways to identify horses that are over priced in the morning markets. There are various different strands I'm following but today I'm looking at horses that are running in handicaps that are running off a mark that is lower than their last winning mark. The idea being that a handicap is a race where theoretically all horses should be weighted to have an equal chance of winning. And I'm looking at horses that are running off of a mark that they can win at. At the moment I don't really have a strategy and am just gathering data and with multiple qualifiers in each race there needs to be further qualifications. But for interest I have pasted today all horses that meet the current criteria along with the best price as of 9.45 this morning. I'm interested not only in how they perform, but also in where the prices end up. As always if you have any thoughts or if you use similar strategies then tell me in the comments.